This article is about the microgame in WarioWare: Smooth Moves. For the microgame in WarioWare: D.I.Y. of the same name, see Dead Ringer (WarioWare: D.I.Y.). Info "‘You found my rings! Put ‘em on my finger!’"
Dead Ringer is one of Tiny Wario's Microgames in WarioWare: Smooth Moves. 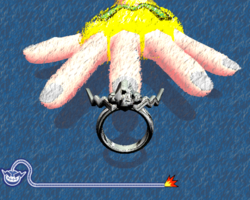 The player must put the ring on the middle finger of Wario's hand. To do this, the player must move the forward when the finger is lined to the object. 1st level difficulty: The hand doesn't move. 2nd level difficulty: The hand moves left and right. 3rd level difficulty: The hand rotates left and right. This page was last edited on February 20, 2018, at 18:00.